While I’m on the subject of cartoons – because of the current exhibit in the Davis Art Gallery – I thought it might be fun to see a cartoon of a tea party, since that phrase is in the news lately. While the subject of this print seems a little more genteel than some of the recent tea party events, the point of this event on the eve of the American Revolution, interestingly enough, parallels the beliefs of current tea party participants: protest of the perception of big government. This print shows us that the unflattering portrayal of political adversaries in cartoons has a long history in western art. When you think of great socio-political cartoonists and caricaturists of the past, who comes to mind? Hogarth? Daumier? Goya? Nast? The latter part of that century saw the rise in satirical artwork in Britain and Europe that mocked prevailing mores and political figures. Many such cartoons addressed legitimate grievances against social ills of the time such as alcoholism or abuse of power by politicians. Other cartoons, however, were nasty nationalistic bashing of other cultures. British satirical artists particularly enjoyed bashing America (for obvious reasons) and France. American artists of the period were equally as venomous in their depictions of the British. The eighteenth century is often called the Age of Enlightenment because of the wealth of forward-looking philosophy, science, and art. It’s also called the Age of Revolution because, naturally, of the American Revolution (1776-1783) and the French Revolution (1789-1799). After the re-discovery and excavation of the ancient Roman city of Pompeii (1748, 1764, 1804), an avid interest in classical antiquity, Greek democracy, and the Roman Republic flourished. In art, this engendered the movement called Neoclassicism. In politics, it led many of America’s founding fathers to advocate revolution. This print documents a gathering of many prominent women of Edenton, North Carolina in October, 1774. This was the year the Continental Congress passed resolutions encouraging Americans to boycott tea, cloth, and other products imported from Britain. The women signed a petition supporting those “near and dear” to them, i.e., their husbands who were active in resisting British authority. 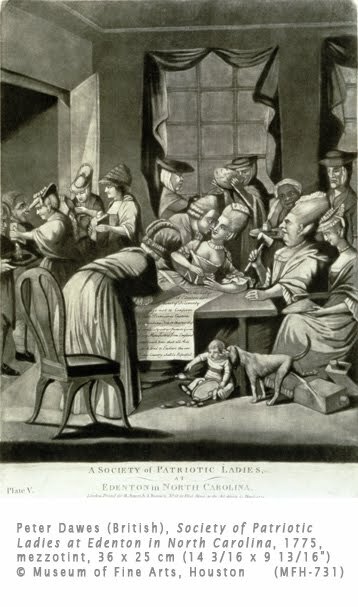 Aside from the fact that this print depicts American women displaying their patriotism, it also documents a revolution of sorts for women. At the time, women were not allowed to participate in politics, nor was it deemed appropriate for them to sign petitions. The British artist obviously alludes to this impropriety in the crude way he depicts most of the women. It suggests that the people leading revolutionary thought in the colonies were wealthy people with nothing better to do. This is emphasized in the foreground where a child is being bothered by a dog rather than tended to by its mother. The gathering was not called the “Edenton Tea Party” until some time later, as a way of vying with the notoriety of the Boston Tea Party.